I have only been sailing a few times in my life, but every time I get on a boat, something changes in me. I don’t know what it is. Is it a relaxation and wide open space? Is it the motion of the boat and the peaceful cruising on the water? Is it the gentle breeze hitting my skin and creating a blissful moment in time? I really don’t know. What I do know, is that every time I am on boat; whether it is a sail boat, speed boat or a junk boat; it really doesn’t matter, the feeling I get is always the same. Happy! A boat cruise is always a great way to spend time, whilst you are on holidays. Regardless of where you go; being on the water is always calming for your mind and exactly what you need on your break from reality. That is why, on our list of things to do in Vietnam, there had to be a tick next to visiting Halong Bay and Bai Tu Long Bay. Here is a video to show you how much fun we had at on a cruise on Halong Bay. 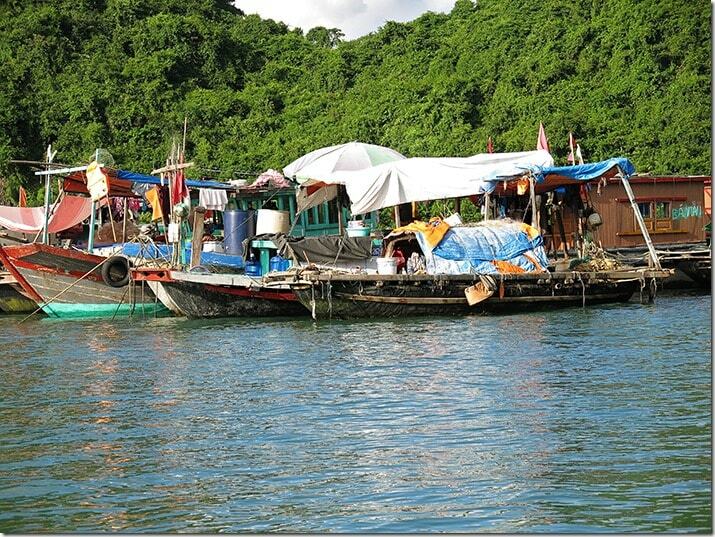 What happens on a Halong Bay Junk Boat Luxury Cruise? 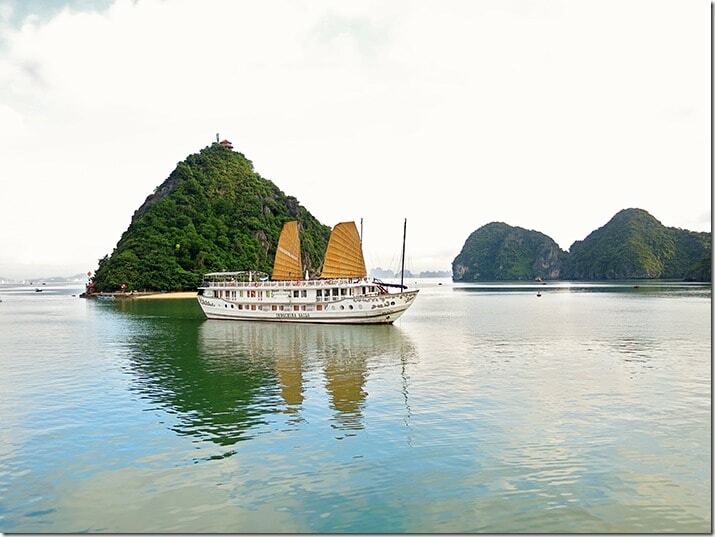 I think that the best way to check out the amazing Halong Bay is on board of an awesome boat. 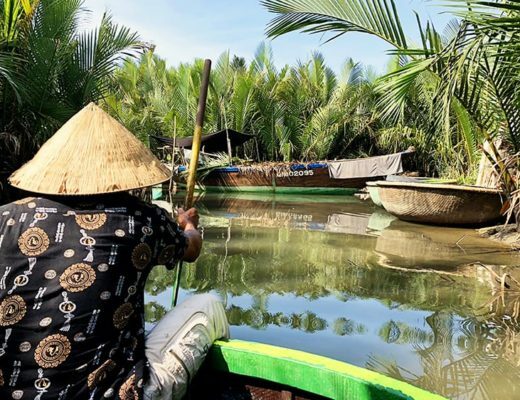 Indochina Sails Junk Cruise was our choice and we LOVED IT! We loved it so much, that we have dedicated a whole post to this awesome cruise and you can check it out here. 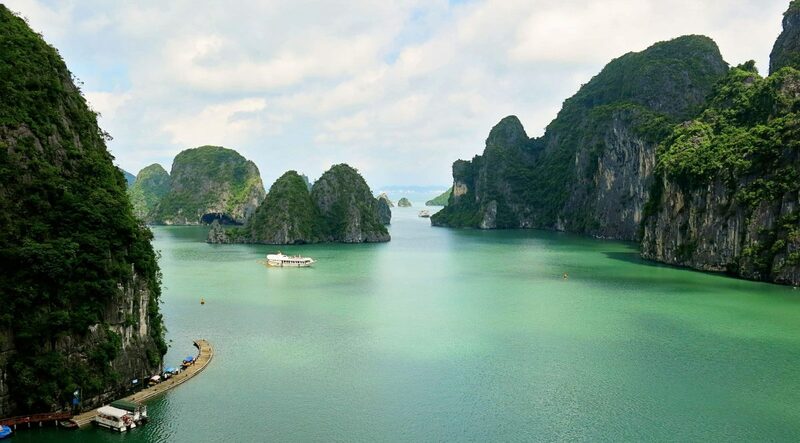 If you are interested, you can also find our list of the best Halong Bay cruises here. 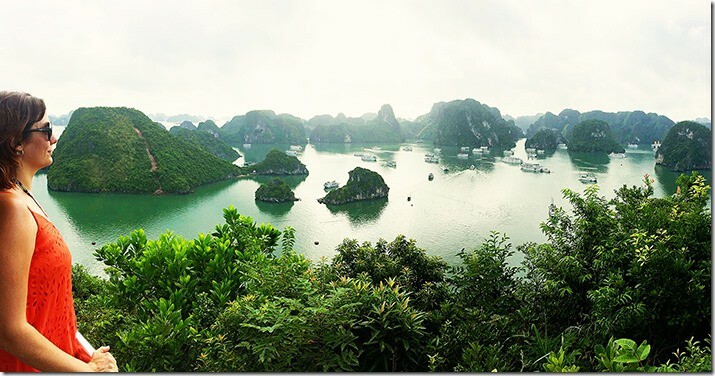 And if you are making your own way to Halong Bay, you might find this post on different ways of getting to Halong Bay useful. 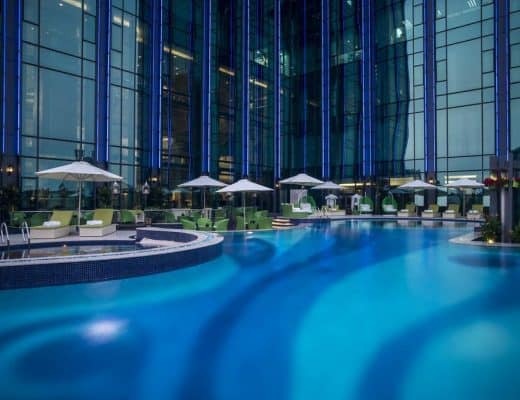 To us, this was the best choice of where to stay on Halong Bay. What can I say? Relaxation to the max on a 5-star boat cruise! No need to think twice about that one. 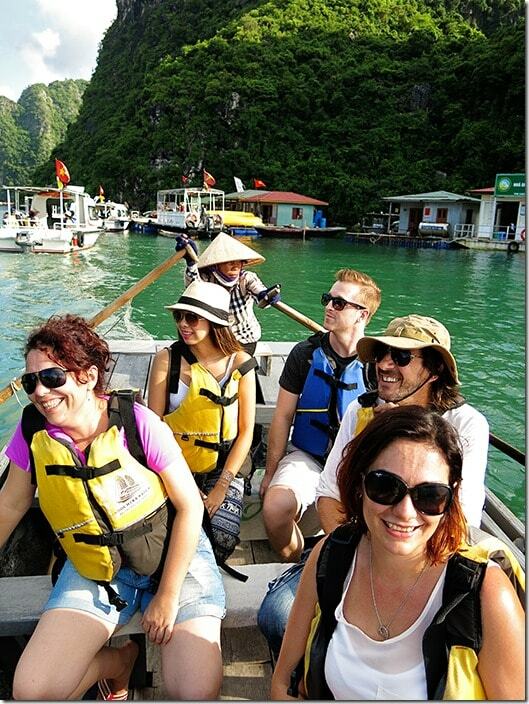 I wouldn’t hesitate in going to Halong Bay with them again. If it is a romantic time that you are searching for with your partner then you will most certainly get it. If it is an adventure that you seek, jumping off the top deck, swimming, kayaking and climbing then you got it here. 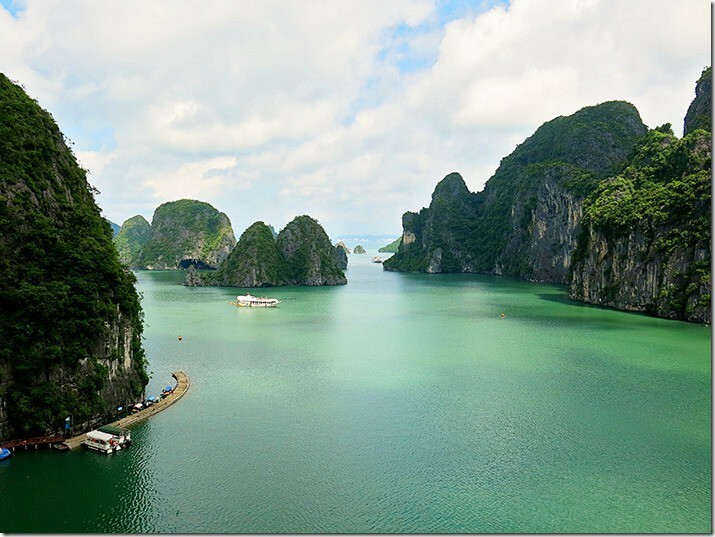 There are loads of fun things to do in Halong Bay and Bai Tu Long Bay. I can list all of those reasons for at least an hour. That is why I wrote a separate post about this awesome junk cruise. All you got to do, is to hop over to the link above. Ok, so I mentioned a bit of climbing. Don’t worry, it is not rock climbing or up sailing. Only few hundred stairs up the Titov Island mountain. Haha… Yup, may look a little bit tiring and you will probably break some sweat when walking up to the summit, but it is definitely worth it. 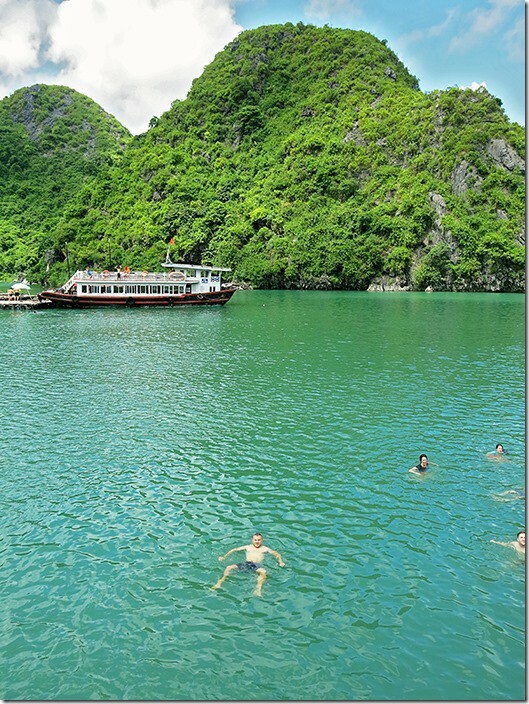 This is where you will get the best and the most spectacular Halong Bay pictures. It is a very popular place and when we were here there was heaps of people making their way to the top. Beach was equally busy, but we had no problem relaxing anyways. Climb to the top and plenty of pics later, followed by a refreshing swim and it is all good! I remember twisting around with my gorgeous wife to check out the view from the water. Mountain is awesome, but seeing all the cool boats anchored all around you made it even more spectacular. Very special place, I recon. 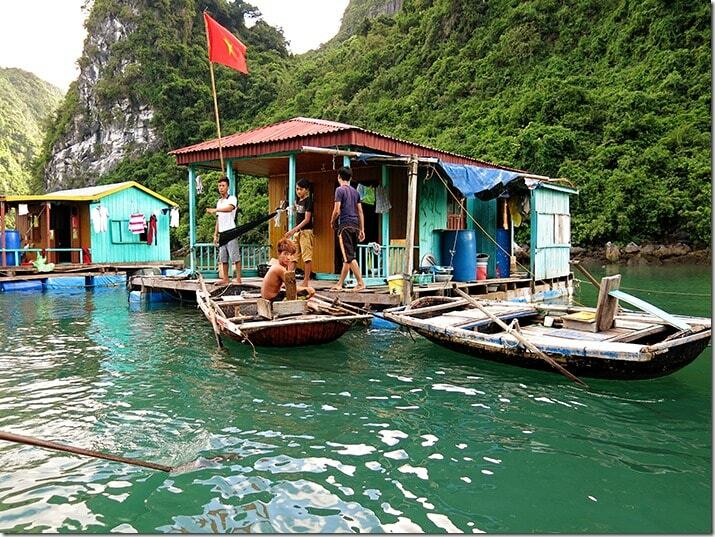 When you research places in Halong Bay, you will find that a lot of the destinations have different names. Some people call Titov island – Titop Island. To be honest, before we went there, I thought it was Tip Top Island. 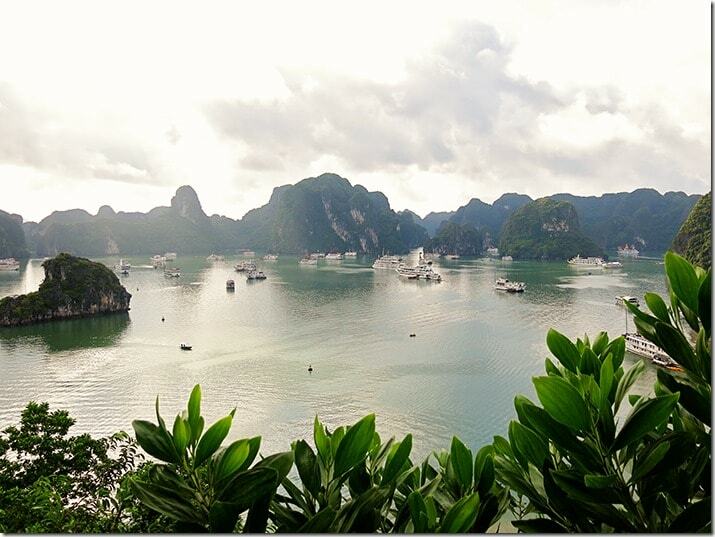 Well, our camera has captured some tip top Halong Bay images. Haha… I crack my self up! Here is another example of naming same place in two different way. Whether you search for Amazing Cave or a Surprise Cave, you will find pictures of the same place. I think that Thien Canh Son Cave was truly amazing. Isn’t is easier to call the places by the first thing that comes to your mind when you see it? Well, in my case, I would be living in a world of Absolutely Awesome and Super Cool. Haha… If you read my posts before, than you would know that these are some of my most used descriptions. 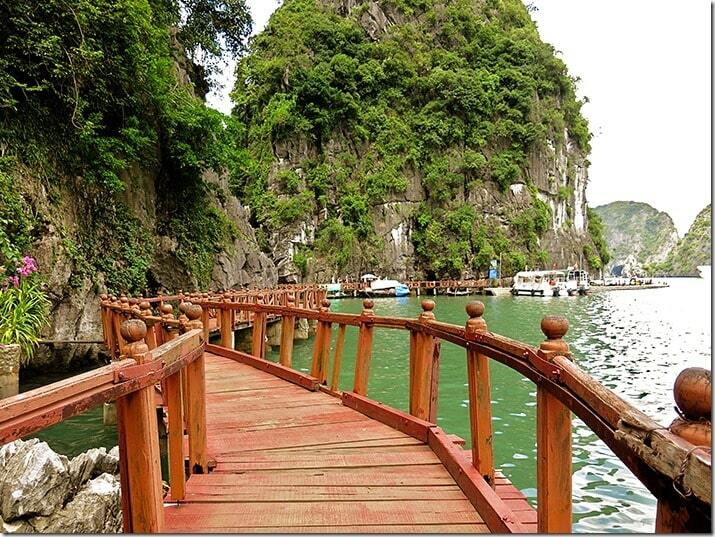 There are countless Halong Bay Caves and you can even go on an organised Halong Bay Cave Tour if you would like to. It is totally up to you. On our trip we visited the Surprise Cave only and it was absolutely awesome! A bit of stair climbing and down the pathway through the super cool spaces inside the mountain we go. The inertia walls of the cave were illuminated with colourful lights only adding to the amazing visual masterpiece of this place. You will really love this one, just like I did! 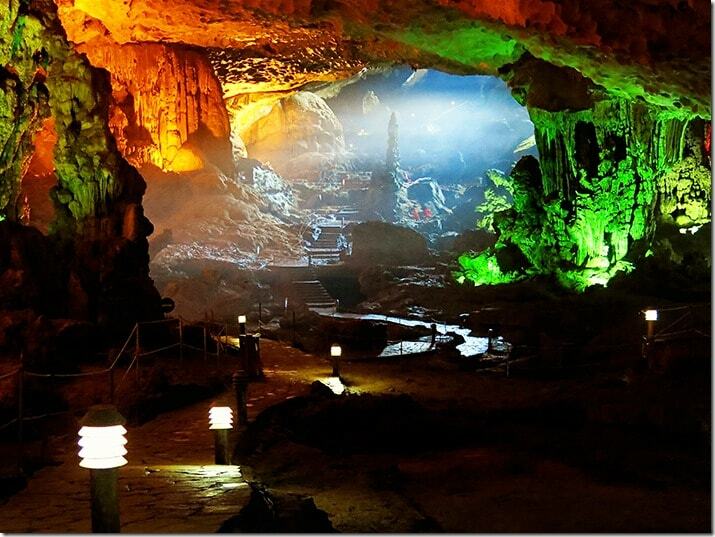 The best cave in Halong Bay, they say! The cave itself is amazing, but you will also have a chance to snap few spectacular photos on the walk to the entrance. I really enjoyed every minute here. Walking on the cliff hugging bridges, climbing few stairs and admiring the view like this. What’s not to love? Halong Bay Pearl Farm is far from my picture in my head, however it is still very impressive. On our tour we have been shown how the pearls are grown, farmed and harvested. All was very interesting, but to me it must have been implanting process that caught my attention. 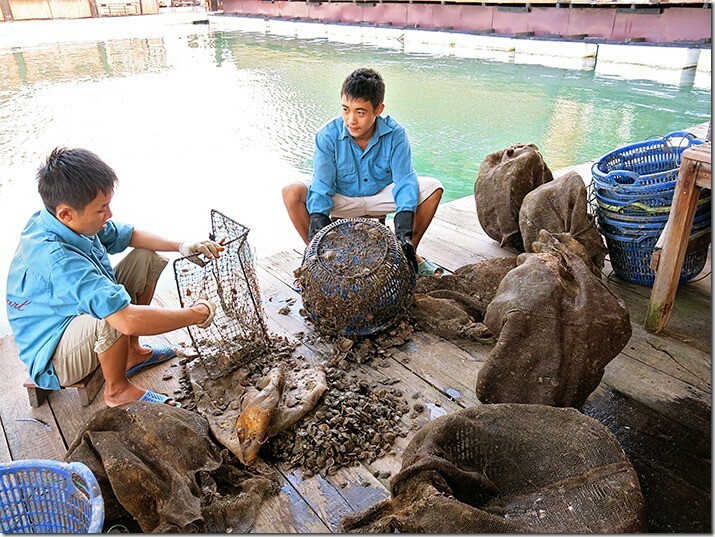 It was very cool to watch, how the specialists insert little plastic balls into the soft tissue inside the Oyster shells. 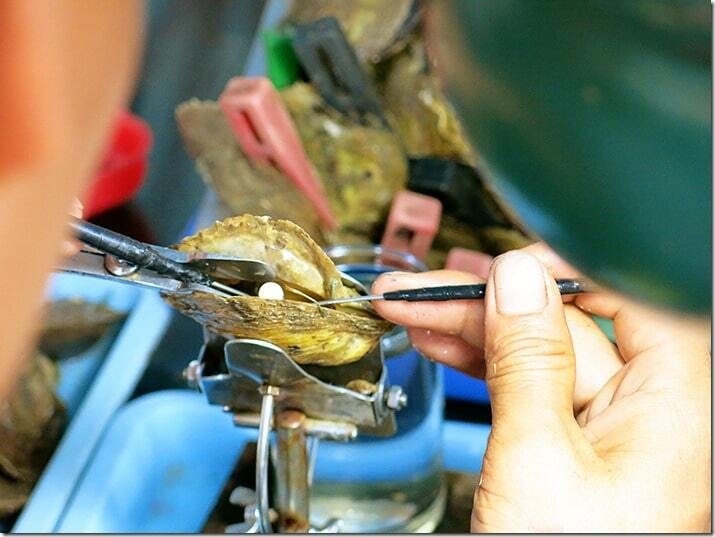 The little plastic ball is there to encourage the Oyster to produce a round shape pearl. If you are interested in purchasing a Vietnam Pearl or a whole chain of pearls on a necklace, then you will definitely need some extra cash here. The choices are endless. We couldn’t resist either and we had to get a souvenir for ourselves as well. I love going to different countries and I love seeing how people live. It makes you appreciate the small things in life. One of the small things that I cannot live without is bacon. But that is another story and I would have to start another blog all together to explain my feelings about this amazing gift from above. Bacon… Now I need to get some! Haha… How easily a man’s mind can be distracted. Ok, back to the story. 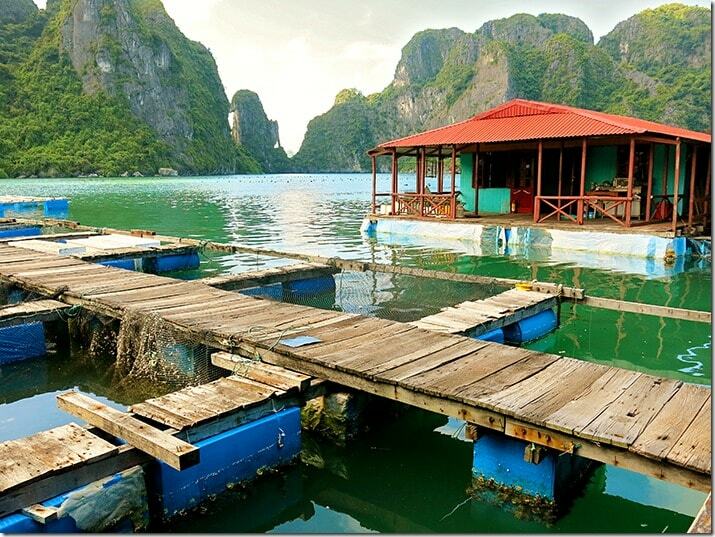 Cua Van – Halong Bay floating village is a simple place. Floating structures are anchored next to each other in a line, all with its own purpose. Some of them are homes, shops and communal rooms. Everything that the locals need is there. And what else do you need? Living in nature, living off the sea and all in a tight-net community. 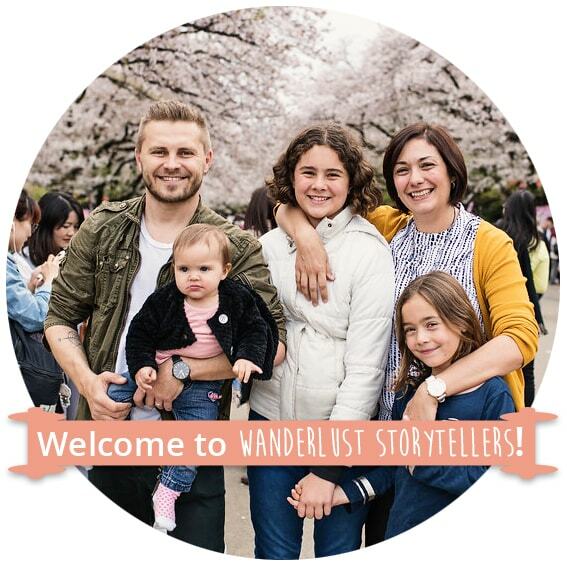 I am aware that it is a bit of a tourist attraction now for us foreigners, however we always make sure to be mindful and respectful on our travels. Giving back to the community that we visit is always important. We made sure to give an extra tip to our boat driver for showing us around her fishing village. 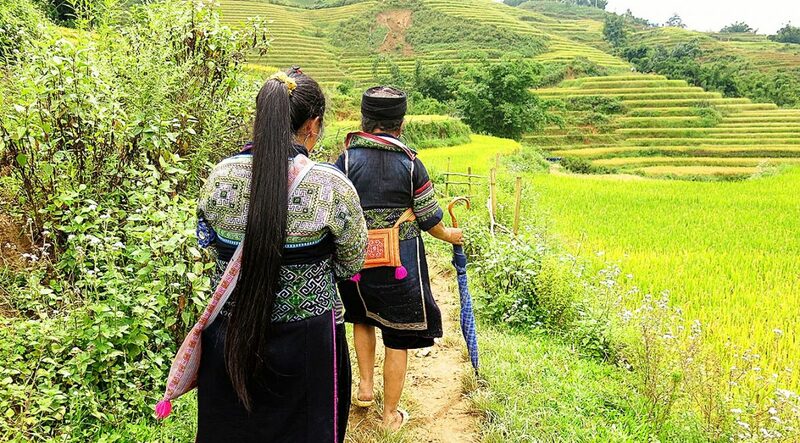 People in Cua Van Vietnam do not have much, however they may have much more then others. Roof over their heads and family, all living together in this peaceful and beautiful place. Ok, so this is the one for those of you that like a little bit of adventure! We have been to many countries and we we went on a kayak on three continents now. Going down the river in Poland was cool and canoeing in Thailand’s James Bond Islands was great too. 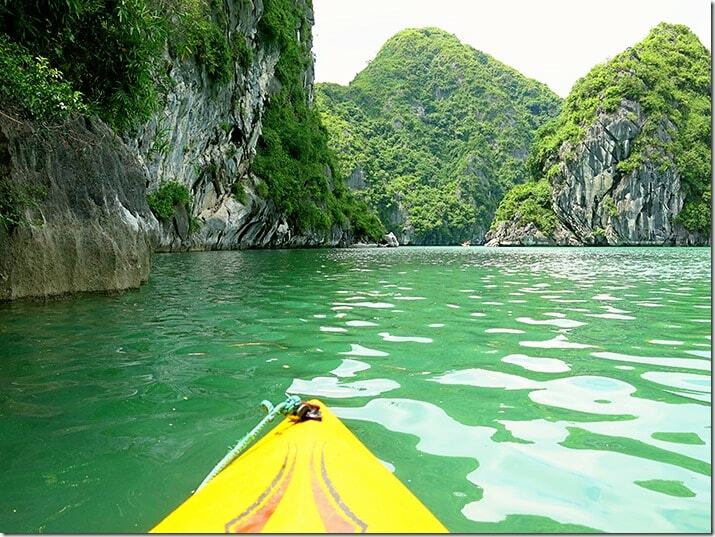 However, kayaking in Halong Bay was my favourite experience yet! 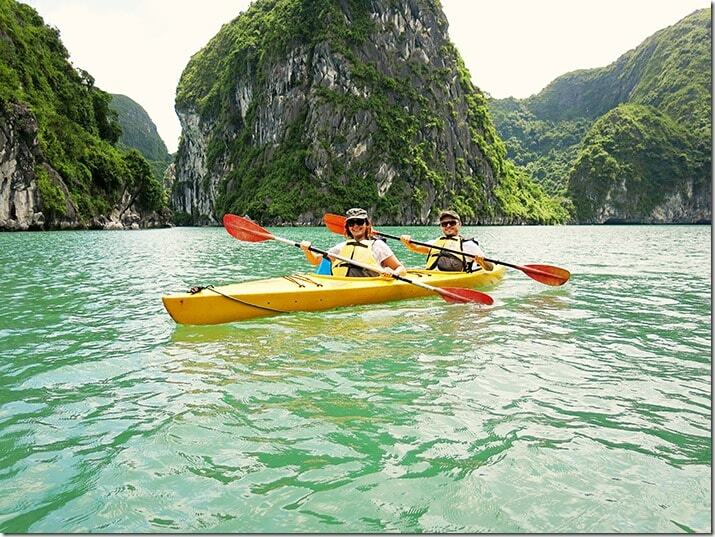 We ventured out in our kayaks for a look around the Halong Bay islands as couples. I am pretty sure that everyone had as great time as we did. The scenery here is amazing and very romantic! Massive rocky mountains pop out from the water right in front of you. It is so cool to come up to the under-water caves and tease to go in. Obviously it is not recommended without a guide and some of the entrances feature a NO GO signs. Better safe then sorry, but still an awesome experience. Whether you are kayaking, climbing or just swimming, you will have plenty of fun! All you got to do is jump in! And what better way than from the top deck of the boat! Yup, sometimes you just need to let go of everything, release the inner adventurer and just jump! 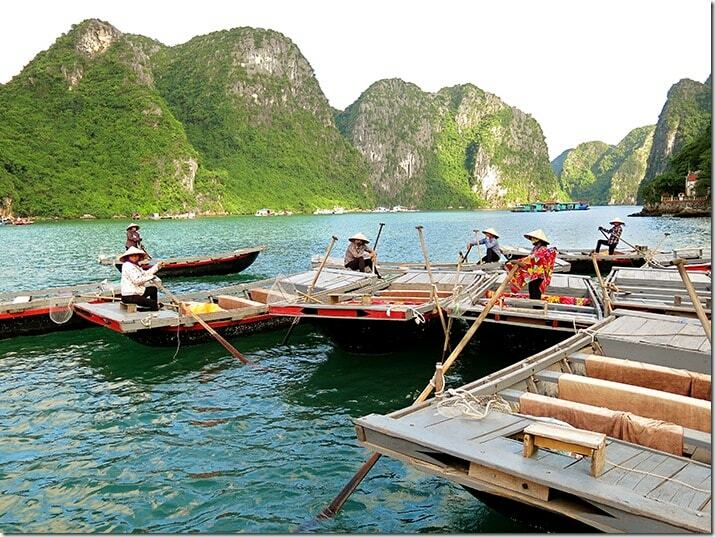 Which of our reasons to visit Halong Bay and Bai Tu Long Bay caught your attention? What dictates your heart, adventure or relaxation? I know what dictates mine, it is spontaneous adventure for sure. All you got to do is put a thought in my mind and my imagination does the rest. Because the only person that is stoping you from enjoying your life to the fullest, it’s you. What are you going to do about it? Haha… That’s right. Change!